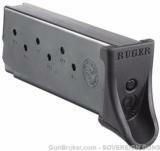 Blued steel 9mm magazine for the Ruger LC9. ALSO A VERIFIED SELLER WITH GUNS INTERNATIONAL. WE ARE THE HONEST & TRUSTED STORE.